In case someone likes the story of Queen Elisabeth of Hungary then this tour has to be chosen and they must visit the Palace at Gödöllő. This is the second largest baroque palace in the world. Sissy has spent here more time than at home in Schönbrunn, she spent here more than 2000 nights. 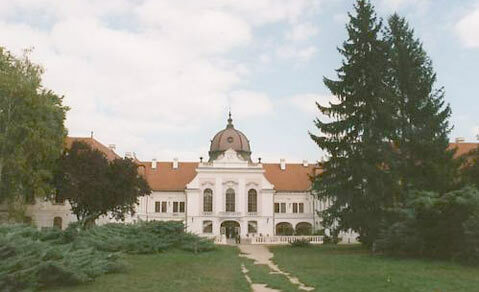 The palace has a long history; the original one was built already in the time of Queen Maria Theresia. Sissy got it as a coronation gift from the Hungarian Government. After the Second World War Russian soldiers used it as a camp. The real reconstruction could be started only in the 1980s. Today the main wing of the palace is totally reconstructed, one can see 26 rooms in the form as Sissy and Emperor Francis Joseph have used them. More parts of the palace are still under reconstruction – just like the stable where Sissy had her favourite horses. The Baroque Theatre is in use again as well. This is the oldest baroque stone theatre in Europe. The garden which belongs to the palace is a Nature Park, a huge area to have a nice walk. During the tour guests get a guided visit in the museum part of the palace, which takes about an hour. In the Palace Café guests can have coffee and some cake. After this short break – in case guests would like to – they can walk in the garden, too.